Professor Ahmed Mabrouk holds a PhD in Economics from Colorado State University, United States, a Master’s degree in Economics, and a Bachelor’s degree in Economics from Zagazig University in Egypt. 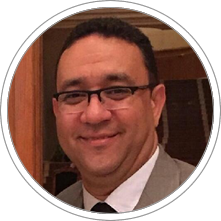 Mr. Mabrouk has been an Assistant Professor at Suez Canal University and at Zagazig University, both located in Egypt. In addition, he is a Professor at the School of Continuing Education in the American University, Cairo, and at the External Study Program from the London School of Economics in Cairo, Egypt. He currently is an Associate Professor and Vice-Dean of Academic Affairs at Misr International University in Cairo, Egypt, Adjunct Faculty at Maastricht School of Management (MSM), the Netherlands, and Associate Professor at CENTRUM Católica Graduate Business School.